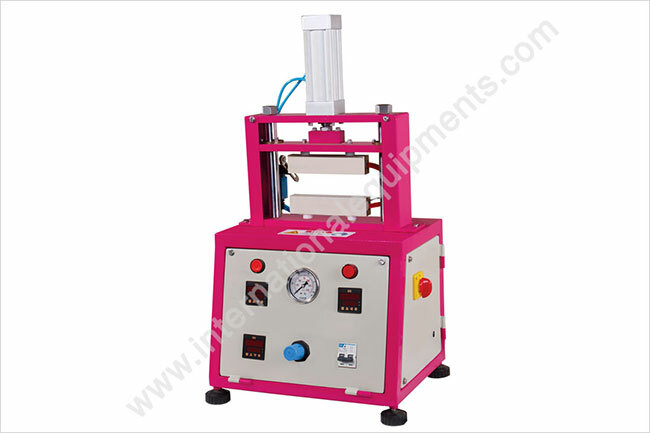 To Determine Suitable Scaling Parameters Of Films. • Temperature zone : Two. • Controller : Auto tuned PID controller with temperature range up to 200ºC having resolution of 0.1ºC. • Clamping Jaws : One fixed and second movable by pneumatic action. • Speed : 300 mm/minute. • Day light : 50 mm. • Sealing dimensions : Length 150 mm x Width 20 mm. • Mounting : Table top. • Power requirement : 230 Volts, 60 Hz, Single phase - 15 ampere.